Lesbia, are enough for me and more. And ancient Battus’ sacred grave. gaze upon humanity’s secret loves. And more for you and your insane Catullus. Which the curious could not count. Bodleian, MS. Douce 195, detail of f. 151r (“Pygmalion embraces the statue, as it lies half-undressed on the bed”). 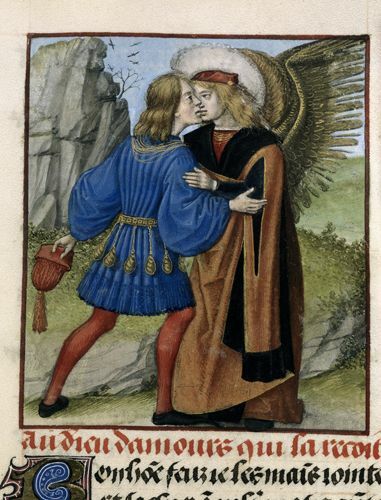 Something is wrong about the caption of the MS, as it shows a young man kissing a doctor of theology (or perhaps law) and he has wings. But it is quite interesting none the less.